Everyone has a backstory, even our own Milky Way galaxy. And much like social media, the picture is not always as pretty as it appears on the current surface, says Texas A&M University astronomer Casey Papovich. Papovich notes that large disk galaxies like our own Milky Way were not always the well-ordered, pinwheel-like, spiral structures we see in the universe today. On the contrary, he and other international experts who specialize in galaxy formation and evolution believe that about 8-to-10 billion years ago, progenitors of the Milky Way and similar disk/spiral galaxies were smaller and less organized, yet highly active in their youth. In previous NASA and National Science Foundation-funded research, Papovich and his collaborators showed that these younger versions of such galaxies were churning out new stars faster than at any other point in their lifespans, suggesting that they must be amazingly rich in star-forming material. And now, they have compelling evidence — the galactic equivalent of a smoking gun. Using the National Radio Astronomy Observatory’s Atacama Large Millimeter/submillimeter Array (ALMA) — a huge, highly sophisticated radio telescope array situated at 16,500 feet altitude in the high desert of Chile — a Papovich-led team of astronomers studied four very young versions of galaxies like the Milky Way that are 9 billion light-years distant, meaning the team could see them as they looked approximately 9 billion years ago. They discovered that each galaxy was incredibly rich in carbon monoxide — a well-known tracer of molecular gas, which is the fuel for star formation. The team’s findings are reported in a paper posted to arXiv and set to be published in the inaugural issue of Nature Astronomy in January. In addition to Papovich, the research team also includes fellow Texas A&M astronomers Ryan Quadri and Kim-Vy Tran, as well as astronomers from Leiden Observatory in Holland, Swinburne University and Macquarie University in Australia, the National Optical Astronomy Observatory (NOAO), the University of Texas at Austin, Lyon Observatory in France and the Max Plank Institute for Astronomy in Germany. Though the relative abundance of star-forming gas is extreme in these galaxies, Papovich says they are not yet fully formed and rather small compared to the Milky Way as we see it today. The new ALMA data indicate that the vast majority of the mass in these galaxies is in cold molecular gas rather than in stars — a situation that Papovich says is reversed at present in our Milky Way, where the mass in stars outweighs that in gas by a factor of 10 to 1. These observations, he notes, are helping build a complete picture of how matter in Milky-Way-size galaxies evolved and how our own galaxy formed. The presence of extensive gas reservoirs backs up the team’s previous observations that provided the first tangible pictures showcasing the unprecedented life story of Milky Way galaxy evolution. Among other details, their prior study revealed a stellar birth rate 30 times higher than it is in the Milky Way today — roughly one per year, compared to about 30 each year 9.5 billion years ago. “Thanks to ALMA and other innovative instruments that allow us to peer 9 billion years into the past to analyze galaxies that are likely similar to the progenitor of our own Milky Way galaxy, we can actually prove what our observations show,” Papovich said. Papovich and his team recently have been awarded more highly competitive time with ALMA to study the temperature and density of the star-forming gas, allowing them to measure and map its transitions and phases and ideally the related impacts within the galaxies. “This will begin to tell us how these galaxies formed stars at such a rapid pace, compared to conditions at present,” he said. Papovich, Quadri and Tran are among roughly two dozen astronomers around the world who have spent years studying carefully selected distant galaxies similar in mass to the progenitor of our own Milky Way that were found in two deep-sky program surveys of the universe, the Cosmic Assembly Near-infrared Deep Extragalactic Legacy Survey (CANDELS) and the FourStar Galaxy Evolution Survey (ZFOURGE). Beyond ALMA, the team’s research has used observations from NASA’s Hubble and Spitzer Space Telescopes and the European Space Agency’s Herschel Space Observatory. The Hubble images from the CANDELS survey also provided structural information about galaxy sizes and how they evolved. Far-infrared light observations from Spitzer and Herschel helped the astronomers trace the star-formation rate. In 2022, the dreams of hundreds of astronomers across the world will become a reality with the completion of a telescope large enough to see to the edge of the universe. The Giant Magellan Telescope is a telescope being constructed in the foothills of the Andes Mountains in Chile, one of the best locations for a telescope in the world. Texas A&M is among a large number of universities and science institutions supporting the project, including Harvard University and the Smithsonian Institution. Nick Suntzeff, A&M astronomy professor, said the sheer size of the collecting area will enable the GMT to see further than any other current telescope. Darren DePoy, A&M astronomy professor, said construction first began on the project in Nov. 2015 and so far, support buildings and infrastructure are almost completed. DePoy said one of the most difficult parts of the project will be constructing the foundation — or pier — the telescope will sit upon. DePoy said once completed, the telescope will have an expected lifetime of between 50 and 100 years. Suntzeff said the project has the majority of the money it needs for completion and is expected to be online by 2022 or 2023. Suntzeff said even though astronomers have expectations for what they will see with the telescope, he expects the unexpected. Jerry Strawser, chief financial officer at Texas A&M, said the university considers the project an investment in science. DePoy said incredible scientific research can be done using the Giant Magellan Telescope. Exoskeletons are enhancing human strength, assisting disabled people and even provide rehabilitation after injuries. Chances are, you’ve seen a person using a powered exoskeleton – what you might think of as a sort of bionic suit – but only in the movies. In the 2013 movie “Elysium,” for example, Matt Damon’s character has an exoskeleton that makes his body stronger and faster than it would otherwise be. Simply described, they are devices that can be externally worn, resembling the skeleton of the body part they are attached to and able to provide support in many ways. That technology isn’t just in science fiction; it really exists and has even been commercialized. It supports devices that enhance human strength, assist disabled people and even provide rehabilitation after injuries. Our work focuses on helping stroke patients’ recovery. Every year, 15 million people worldwide suffer a stroke. More than 85 percent of them survive, but only 10 percent recover completely. The rest must deal with mobility impairment and cognitive disabilities. Stroke victims can get help relearning skills they have lost or learn new ways of performing tasks to compensate for lost abilities. The most effective rehabilitation is specific to the skills the patient needs, and of sufficient intensity and duration to truly retrain the nerves and muscles involved. However, the number of trained human therapists who can provide this support is limited, while the demand is growing, particularly as populations age. We at the Laboratory for Control, Robotics and Automation (LCRA) at Texas A&M University are working to help solve this problem by developing an intelligent robotic device that can provide therapy services in hospitals and clinics as an enhancement to conventional therapy methods. Our device will be connected to a patient’s upper arm and back during therapy sessions, providing individualized movement assistance to increase strength and flexibility. Such a device benefits therapists by reducing the physical load of their jobs, and patients by providing affordable and widely available therapy opportunities. Initial development of the exoskeleton was at the Laboratory for Control, Robotics and Automation at Texas A&M University. Author provided. The number of elderly people worldwide is growing, as life expectancies increase. The U.S. Census Bureau estimates that the number of Americans age 65 or over will double by 2050. Research suggests that people in that age group have an increased risk of suffering a stroke. We expect the number of stroke survivors who need rehabilitation services to rise significantly in the near future. According to the U.S. Bureau of Labor Statistics, the number of occupational therapy and physical therapy jobs is expected to increase 27 percent and 34 percent, respectively, by 2020. 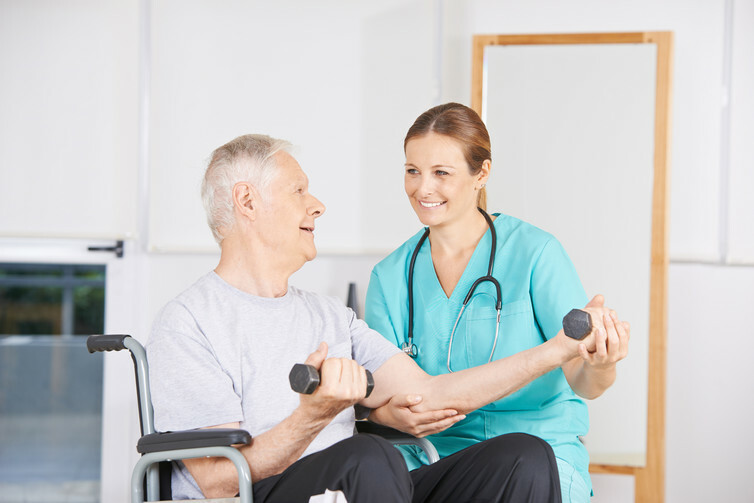 Though interest in the field is growing, the American Academy of Physical Medicine and Rehabilitation projects the current physical therapist shortage will increase significantly in the upcoming decades. Efforts to keep rehabilitation at its current service quality could result in a shortage of as many as 26,000 physical therapists by 2020; improving service or updating it to reflect ongoing research will require even more people. While there remain a number of things that only human therapists can do, many rehab exercises are highly repetitive. This is where robotic systems excel: They can perform the same task countless times, with precision and accuracy without fatigue or loss of attention. Many researchers around the world have developed robotic devices for rehabilitation purposes. These devices are typically designed specifically to work on patients’ paralyzed arms or legs. Many clinical studies confirm the effectiveness of automated therapy; in some cases it is even better than conventional therapy. However, there is still a long way to go. Despite the many benefits robotic based rehabilitation can offer to society, not many clinics are equipped with such devices. Rehabilitation exoskeletons often require very complicated design and control processes, which usually result in bulky, heavy and expensive devices. In addition, patient trust or comfort with a therapist might be reduced when interacting with a robot. These challenges limit the usage of robotic devices to research centers and a few rehabilitation centers. Considering the significant role of exoskeletons in the future of rehabilitation, it is time to address these challenges. Our work is focused on developing a lighter, more compact robotic exoskeleton device that can help stroke patients recover strength and motion in their arms. To this end, we have done detailed analysis of even the simplest device components. Performing a close analysis of device components. Author provided. While development is ongoing, we are using new technologies and have adopted the most recent findings of rehabilitation science research to build a device that better prepare patients for activities of daily living. In addition to helping stroke patients, this device can also be used for rehabilitation of other patients with arm disabilities or injuries. The technical evaluations of the device will be completed on the Texas A&M campus in College Station early next year. Once the safety of device is guaranteed, we will test it on real stroke patients in Hamad Medical Center in Doha, Qatar by fall 2017. Our final goal is to develop home-based exoskeletons. Currently portability, high costs and limitations on the performance of the available systems are the main barriers for using rehab exoskeletons in patients’ homes. Home-based rehabilitation could dramatically improve the intensity and effectiveness of therapy patients receive. Robots could, for example, allow patients to start therapy in the very early stages of recovery, without having to deal with the hassles of frequent and long visits to clinics. In the comfort of their own homes, people could get specific training at the appropriate level of intensity, overseen and monitored by a human therapist over the internet. Maximizing therapy robots’ ability to help patients depends on deepening the human-robot interaction. This sort of connection is the subject of significant research of late, and not just for patient treatment. In most cases where people are working with robots, though, the human takes the lead role; in therapy, the robot must closely observe the patient and decide when to provide corrective input. Virtual reality is another technology that has proven to be an effective tool for rehabilitation purposes. Virtual reality devices and the recently developed augmented reality systems can be adapted to use with rehab exoskeletons. Although linking the real and virtual worlds within these systems is a challenging task, an exoskeleton equipped with a high fidelity virtual- or augmented-reality device could offer unique benefits. These opportunities are challenging to be realized. But if we manage to develop such systems, it could open a world of fantastic opportunities. Imagine automated rehabilitation gyms, with devices specific to different motions of different body parts, available for anyone who needed them. But there are even more miraculous possibilities: Would no one need a wheelchair anymore? These devices can also help reduce the social isolation many stroke patients experience. With the aid of augmented reality tools, therapy robots can help patients interact with each other, as in a virtual exercise group. This sort of connection can make rehabilitation a pleasant experience in patients’ daily lives, one they look forward to and enjoy, which will also promote their recovery. This technology could have everyday uses for healthy individuals, too. Perhaps people would one day own an exoskeleton for help with labor-intensive tasks at home or in the garden. Factory workers could work harder and faster, but with less fatigue and risk of injury. The research is really just beginning. As a child peering through her toy telescope, Texas A&M University graduate student Ting Li was fascinated by the Moon and constellations — not so much by their cosmic beauty, but about why they exist in the first place. Now working toward her doctorate in astronomy as a member of Texas A&M’s Charles R. ’62 and Judith G. Munnerlyn Astronomical Laboratory, Li has developed her own instrument designed to help scientists understand more about the cosmos. Li’s breakthrough device — dubbed the Atmospheric Transmission Monitoring Camera, or aTmCam — provides an innovative and efficient way of measuring subtle changes in the light that is constantly moving throughout the atmosphere. The resulting data will used by scientists as part of the Dark Energy Survey, a five-year investigation to understand the mysterious expansion of the universe. Li’s aTmCam, located at the Cerro Tololo Inter-American Observatory in Chile, is housed in a mini-observatory that she and a Munnerlyn Lab team of undergraduate researchers hand-built. Completely computer-automated and operating on a script programmed by Li, the device is comprised of a row of four high-power telescopes mounted with four charge-coupled device (CCD) cameras, each with a different filter. On clear evenings, the mini-observatory’s seven-foot diameter dome opens, and aTmCam aims at a target star in the night sky. Each of its four cameras will capture a unique image of the wavelengths of light transmitted by the star. By observing specific features of the four images, Li can track changes in the atmosphere, providing preliminary data that DES scientists then will use to calibrate the photometry of Type Ia supernova — considered the best cosmological “standard candles” for measuring cosmic distances — taken as part of the survey. As it stands, Li’s aTmCam will be in operation at least for the duration of the survey, but she believes it could have a much longer shelf-life, not to mention broader appeal. For starters, any researchers interested in observing variable stars and exoplanets may find aTmCam useful in determining if any irregularities are due to the star itself or to the atmosphere. Thanks in part to the precision science and astronomical instrumentation expertise represented within the Munnerlyn Lab and the George P. and Cynthia Woods Mitchell Institute for Fundamental Physics and Astronomy, Texas A&M has a key role in several major astronomical ventures across the world. Perhaps the most colossal is the Giant Magellan Telescope project, an 11-partner international collaboration working to construct the world’s largest telescope in Chile by 2019. The next-generation wonder features seven massive honeycomb mirrors and an adaptable optics system that hinges on state-of-the-art astronomical instrumentation, including first-light instruments being built at Texas A&M. In 2010, Texas A&M astronomers were tasked with building the world’s premier survey spectrograph, the Visible Integral-Field Replicable Unit Spectrographs (VIRUS), a key component in the National Science Foundation-funded Hobby-Eberly Telescope Dark Energy Experiment (HETDEX), one of the first international efforts to probe and understand dark energy. Beyond high-profile global partnerships, the Munnerlynn Lab’s broader astronomical contribution is in training future astronomers — undergraduate and graduate students like Li who have had direct involvement in the construction of the instrumentation and the resulting accumulation of data. For Li, it’s the culmination of a three-year process of constructing prototypes and test runs that involved multiple trips to Chile, often in extreme conditions. On more than one occasion, Li endured the high altitude’s freezing temperatures for hours at a time while making sure aTmCam ran properly.